Knocking out genes helps biologists understand their function within human cells. Further, in therapeutic application, knock out of a pathogenic gene may treat an inherited disorder, which is the case for sickle cell anemia and muscular dystrophy. However, for many of these cases, high efficiency editing is required to get the required effect. One way in which we can easily test gene editing efficiency is by using human reporter cells, whose nuclei glow red. These cells have been engineered to express the gene mCherry in their nuclei, making the nuclei appear red when viewed under a fluorescence microscope. 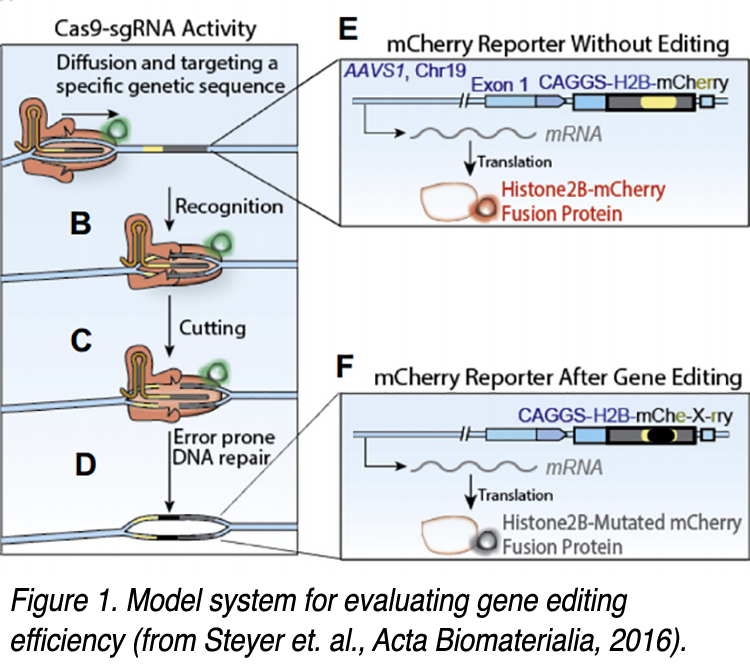 By making a gRNA that targets the mCherry gene for disruption and transfecting it with Cas9, successful cutting can be measured by the percentage of cells losing their mCherry fluorescence, as illustrated in Figure 1 (use the magnifying glass icon to show a larger version). To optimize different aspects of the gene editing process, we needed to make sure that the Cas9 protein we use is efficient and generates reproducible results. We screened multiple variants of Cas9 protein from different companies to find one we can reliably use for our research. We used our model system in human embryonic kidney (HEK) cells, using lipofection, to compare the efficiency of mCherry knockout. 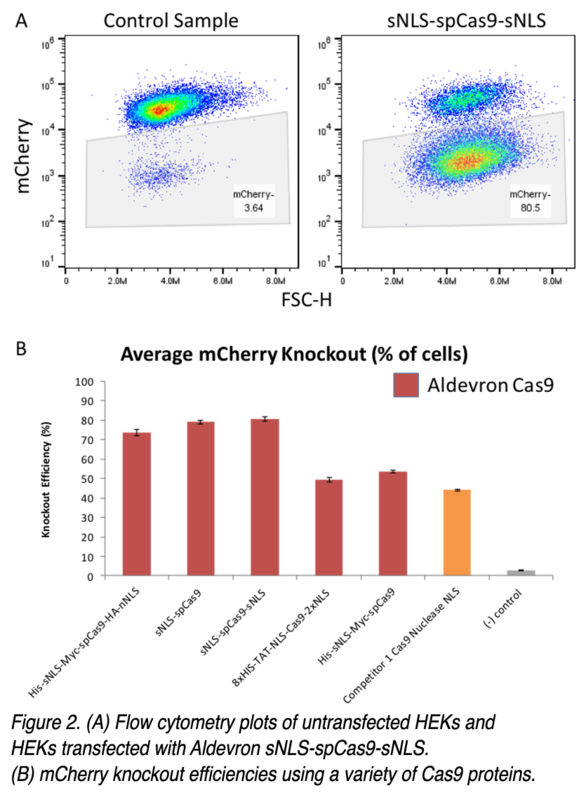 Figure 2 shows some of the mCherry knockout efficiencies we measured using flow cytometry. We saw high knockout efficiency of the engineered Cas9 variants from Aldevron, compared with the competitor’s product. The nuclear localization signal (NLS) on Cas9 helped translocation of the Cas9 RNP to the nucleus and increase efficiency. Furthermore, the high Cas9 concentration of Aldevron’s formulation allows us to effectively use the required amounts of protein without diluting it extensively with our other reagents or cell media. After obtaining high repeatability of results with these proteins, we are now able to quickly advance our disease modeling and regenerative medicine research. 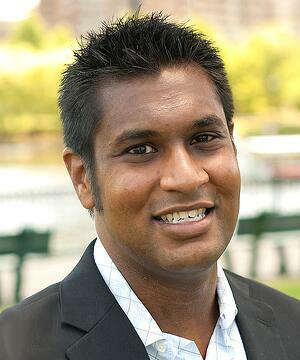 Krishanu Saha is an Assistant Professor in the Department of Biomedical Engineering at the University of Wisconsin-Madison. He is also a member of the Wisconsin Institute for Discovery in the bionanocomposite tissue engineering scaffolds theme. His research vision is to develop new human stem cell models and therapies using novel biomaterials and genetic engineering techniques. His laboratory uses both experimental and computational approaches to generate new cells, organoids and tissues from patient samples, as well as a suite of gene-editing technologies to knockout, correct or insert transgenes into human cells. Major thrusts of his lab are on cell engineering of cell types found in the retina, central nervous system and blood.